1923 The four Warner brothers' film distribution and production business was incorporated and called Warner Brothers Pictures Inc. - one of the first large film studios. They released the 6-reel comedy-drama The Gold Diggers (1923), now a lost film. 1923 At the Rivoli Theatre in New York, Lee de Forest demonstrated a sound-on-film method for recording sound on the edge of the film strip, called Phonofilm. He projected a series of short musical films featuring vaudeville performers. It would become the industry standard. 1923 The Eastman Kodak company introduced their new and less expensive film gauge format (16 mm) in the United States. It was originally designed for amateurs or home users, and was offered as a package deal (for $335): a camera, projector, tripod, screen and splicer. However, due to its popularity and versatility for many uses, it soon became a professional format. 1923 One of the highest-grossing films of the year was Paramount's and James Cruze's feature-length western The Covered Wagon (1923). It was an expensive effort which cost $800,000 yet brought $4 million at the box-office. The film was the historical drama of a wagon train in the mid-1800s moving westward, encountering harsh environmental and weather conditions (a river crossing and prairie fire), and of course, hostile Indians. Hollywood was encouraged to produce many more westerns in subsequent years. 1923 Handsome 31 year-old silent era actor Wallace Reid had been appearing, on average (over a seven-year period) in as many as one feature film every seven weeks, when he died of influenza and a weakened immune system. The real cause of his death was an overdose, due to his alcoholism and severe drug addiction to morphine (allegedly supplied by the studio to keep him working following a train wreck back injury). This was one of many scandals that would rock Hollywood and eventually lead to attempts to clamp down and prompt the implementation of the motion picture production code (Hays Code) in the early 1930s. 1923 Harold Lloyd, the bookish, horn-rimmed glasses, straw-hat-wearing comedian and Everyman hero, nicknamed "the King of Daredevil Comedy," thrilled audiences with his death-defying stunts in Safety Last (1923). This successful film is most remembered for its thrilling, hair-raising climax - a reckless, 'safety last,' humorous stunt on the side of a twelve-story skyscraper above busy city streets. The scary sequence was deliberately shot with most of the camera compositions including views of the perilous drop behind him. 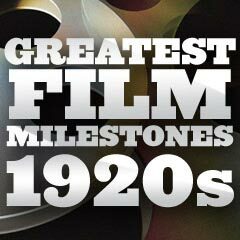 1923 Director Cecil B. DeMille's first version of the Biblical epic The Ten Commandments (1923) was the most expensive film ever made and featured the largest set ever constructed in movie history to that time - the 'City of the Pharoahs' (gates 120 feet tall and 720 feet wide, and with four massive 35 foot tall Egyptian statues weighing 1,000,000 pounds). After the big-budget film was made, the director ordered the set in San Luis Obispo County (California) bulldozed and buried -- 60 years later, archeologists uncovered part of the set at the location known as the Guadalupe-Nipomo Sand Dunes. DeMille remade his silent epic in 1956. 1923 De Mille's epic The Ten Commandments (1923) was also the first film to portray a false protagonist (for example: Moses was presented as the main character in the film's first third - a prologue about the Exodus from Egypt, but then a major shift occurred, moving away from the Biblical story to a modern story set in the Roaring Twenties that contrasted the lives of two brothers: John and Danny McTavish). 1923 In the first filmed version of Victor Hugo's novel The Hunchback of Notre Dame (1923), Lon Chaney was transformed into the deformed hunchbacked bellringer for the silent film with extensive, convincing makeup (a wig, puffy cheeks, false teeth, fake eye, etc.). 1923 The Hollywood sign (originally advertising and spelling out HOLLYWOODLAND) was built above town in 1923 for $21,000 by a real estate developer. It was not an advertisement to promote the major film studios, but was actually put up above the Hollywood Hills to advertise a local real estate development in nearby Beachwood Canyon - and was only supposed to be installed for 18 months. The sign lost its suffix "LAND" in 1949 when the Hollywood Chamber of Commerce began a contract with the City of LA Parks Department to repair and rebuild the sign. 1923 Paramount Pictures' silent comedy Hollywood (1923) by director James Cruze, a "lost film," starred Hope Drown in her film debut (and sole film appearance) as aspiring actress Angela Whitaker who ventured to Hollywood. Due to cameos by dozens of silent film era stars (i.e., Roscoe 'Fatty' Arbuckle, Charlie Chaplin, Cecil B. DeMille, Anna Q. Nilsson, Richard Arlen, Noah Beery, William Boyd, Bebe Daniels, Douglas Fairbanks, Ben Turpin, Tim Holt, Zasu Pitts, Mary Astor, Mary & Jack Pickford, Alan Hale, William S. Hart, Pola Negri, Will Rogers, Sid Grauman, and Gloria Swanson), it was necessary to fill the main characters' roles with unknown performers. 1923 The Fleischer Brothers (Dave and Max) produced the first feature-length animation (a documentary), titled The Einstein Theory of Relativity.